As a game studio, we know that not all content is right for learning games, so we take the time to vet all of our ideas to ensure they make the best games for the classroom. Our recent release, Molecubes, was tested extensively throughout its development to make sure it was enjoyable and educational as a piece of learning game content. Beyond the content itself though, we also need to test for classroom utility. 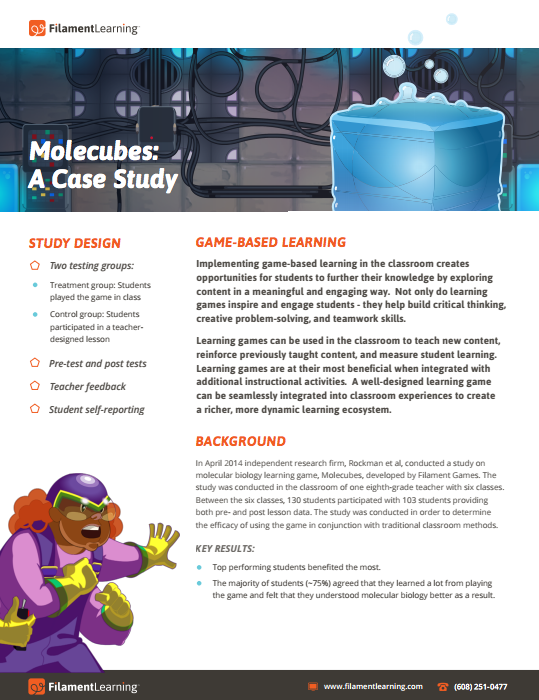 In May 2014, we partnered with Rockman et al to validate Molecubes as a tool for educators. By determining the efficacy of using the game content in conjunction with traditional classroom methods, we were able to measure the value that teachers get out of formally implementing the game. Check out the results below!